A United Launch Alliance Atlas 5 rocket rolls out to the launch pad carrying the U.S. Air Force's GPS 2F-7 navigation satellite. The mission will launch Aug. 1, 2014 from Cape Canaveral Air Force Station in Florida. The United States Air Force will loft a new, advanced GPS satellite into orbit tonight (Aug. 1), and you can watch the launch live online. 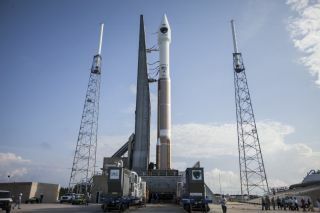 The Air Force's GPS 2F-7 is set to launch to space atop a United Launch Alliance Atlas 5 rocket at 11:23 p.m. EDT (0323 Aug. 2 GMT) on Friday from Cape Canaveral Air Force Station in Florida. The new satellite will help to further bolster the Air Force's Global Positioning Satellite network, used by civilians and military personnel around the world to map their locations, time and velocity. The Air Force is set to launch the GPS 2F-7 satellite into orbit on August 1, 2014. This launch will mark the third GPS satellite launch this year, and it is the seventh in a series of 12 satellites, according to Air Force officials. The GPS network of satellites is the Department of Defense's largest satellite constellation, and it includes 31 currently operational satellites in orbit now. In all, the Air Force's GPS constellation needs 24 satellites to be fully functional, however, the extra spacecraft provide some backup in case any problems pop up. The $245 million GPS 2F-7 will join six GPS 2-As, 12 GPS 2-Rs, 7 GPS 2-RMs and the six other GPS 2-F satellites already orbiting Earth. "GPS 2F-7 is the seventh in a series of next generation GPS satellites and the second in this series launched aboard an Atlas 5 launch vehicle," Laura Maginnis, ULA's deputy director of mission management, told reporters. "The satellite will incorporate various improvements to provide greater accuracy, increased signal and enhanced performance for GPS users around the world." The new, advances satellites are also more resistant to jamming than previous models were. Space.com partner Spaceflight Now will provide up-to-the-minute information on tonight's launch through their Mission Status Center for GPS 2F-7. Space fans can also follow United Launch Alliance's Twitter page for updates from the spaceflight company during the launch.